We would look forward to it for months, and during the last few weeks the anticipation was nearly unbearable. We would consult the weather reports, read the outdoor pages in the newspaper, and check and recheck our gear. Then it would arrive, the opening day of trout season, Christmas, the 4th of July, and Thanksgiving all rolled into one day. Back in the 60's I lived just outside the city of Detroit, and heaven on earth was nearly 200 miles away near a town called Grayling. Within 20 miles of that small northern Michigan town the three branches of the Au Sable River flow away toward Lake Huron, and from its tannin stained waters fabled hatches of insects lure trout to the surface to feed with reckless abandon. Canoe Harbor, Keystone Landing, McMaster's Bridge, Dogtown, High Banks, and Conners Flat, and Hollow Leg were as familiar as my backyard. 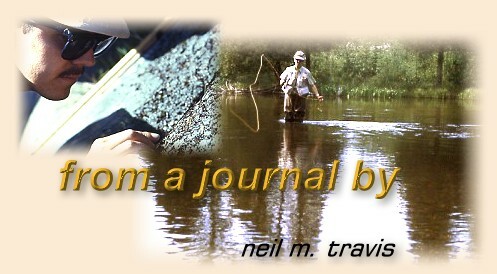 It was a forgone conclusion that come opening day of trout season I would be somewhere on the Au Sable River. In the early days it was Canoe Harbor on the South Branch, and in later years it was Keystone Landing on the Main Branch. Since opening day of trout season always happened on the last weekend of April it was a good bet that there would still be snow drifts back in the woods, some of the back roads in the Mason Tract might still be impassable, and there would be places where you did not dare to wade. Rain or snow, come H... or high water come Saturday morning I would be somewhere on the Au Sable fishing for trout. I was never alone in my pursuit; in fact looking back it was the people that made those days so memorable. Some of my fellow anglers I had not seen since the close of trout season the proceeding fall, and it was always with some apprehension as we waited to see if everyone would return for another season. It was like old home week as each car pulled into the campground, and each old friend stepped out with an outstretched hand, reaffirming the bond that was forged over campfires, and long walks through the dark woods after an evening of fishing. Me, JC, Dean, Tom, Bob, et al, were there as much for the camaraderie of old friends as for the fishing, which, on most occasions, was problematic at best. Those were the days without the Internet, instant stream reports, and the like, and what the conditions might be in any given year was a subject of much conjecture. At best we could hope that the Au Sable was wadable, and that a sufficient number of warm days had melted most of the snow out of the campground. If we were real fortunate we might be able to find a brief hatch of Hendrickson's or some Chimarra caddis, and a few trout rising for them. We all knew that the fishing would be better in a few weeks, but it would not be spring, it would not be trout season, and it would not be right not to be on the Au Sable on opening day.